Flag Rugby is a fun, all-inclusive way to introduce young girls to the fundamental skills of rugby with a big emphasis on having fun! No experience is needed to play and all are welcome to come try it out! Flag Rugby substitutes a traditional “tackle” with a flag pull. Flag Rugby is perfect for new players! 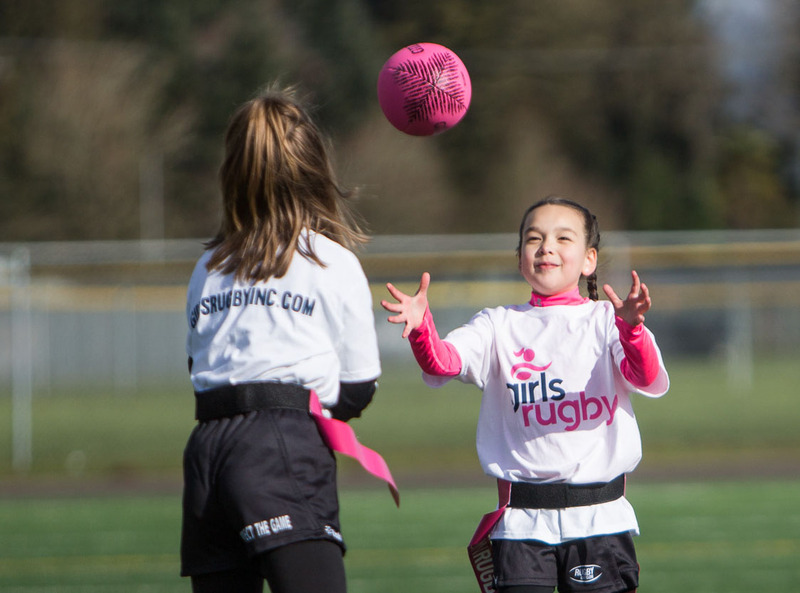 Girls Rugby will be offering leagues based throughout Oregon and SW Washington. Check out the information below on the closest team/league to you! Don’t see one nearby? Contact us about getting one set up! All leagues will run for 7 weeks, including 5-6 weeks of one practice day and one game day. The last week will be a Girls Rugby Parent-Daughter Day to celebrate the season. WHEN ARE PRACTICES AND GAMES? Teams will practice 1 weeknight per week and have game days typically on weekends (location specific). Practice day and time will vary based on location (scroll down to see specific dates/times based on team location). Costs of the season include programming for 7 weeks led by Girls Rugby staff, access to qualified coaches and referees for practices and games, Girls Rugby Membership, USA Rugby Membership, Jerseys (home and away), Shorts, Socks and an official Girls Rugby Ball. Girls Rugby is excited to announce a new opportunity for girls to fall in love with rugby through our Girls Rugby Day Camps! Camp participants will enjoy a week-long rugby program filled with fun rugby games and activities that will give girls the true Girls Rugby experience in a camp format. Over the course of the camp, girls will have the opportunity to become rugby super stars as they work on their passing, catching, running, flag-pulling, and scoring techniques. All of our Girls Rugby Camp Coaches will deliver exciting activities and games, giving each participant a truly memorable experience. In addition to building their rugby skills, campers will also get to experience the values-based curriculum where Camp Coaches introduce new values each day through engaging and interactive activities. All campers will receive an exclusive Girls Rugby T-shirt included in your Girls Rugby Camp registration. For more information on our Girls Rugby Camps, please contact info@girlsrugbyinc.com. Lieser School in Vancouver, WA.